Move over, Manchego! There’s a new kid on the block when it comes to buttery Spanish cheeses, and its bright orange color and unique flavor are sure to be a hit. If you’re new to Mahón, now’s your chance to try it—it’s currently on special for $3.00 off per lb! 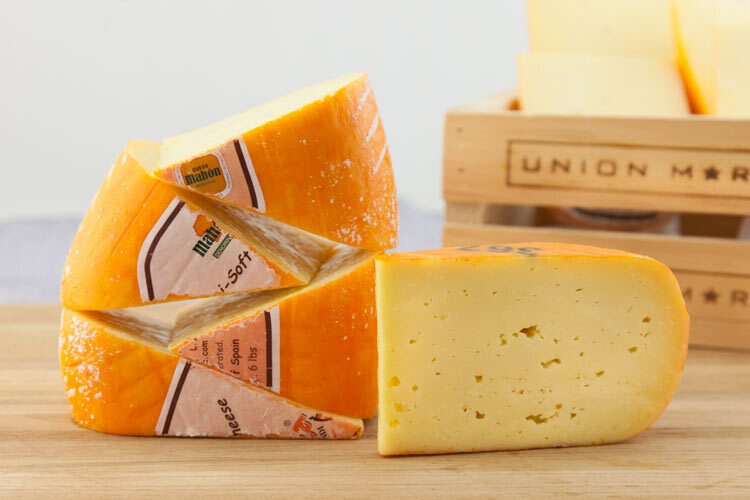 Made of pasteurized cow’s milk and named after a Mediterranean port in Spain, Mahón has a bright orange rind and yellow-ivory interior flecked with tiny holes. Its salty taste is said to come from the sea grasses that the cows eat there. The soft texture and versatility of our artisanal, semi-cured Mahón means that it can be enjoyed on sandwiches, nibbled alongside charcuterie, or simply sliced up and sprinkled with olive oil, black pepper, and tarragon. Mahón is also great in mac and cheese and grilled cheese sandwiches. Or use it to top our crispy Union Market tortilla strips (also now on special) for some killer nachos!